A few years back, my brother was in a bad motorcycle accident. He was in the hospital for a long time. He’s OK now…that’s not the story I’m going to tell today. But he is the reason that my mother, who lived 350 miles away from us, practically lived with me for a while. 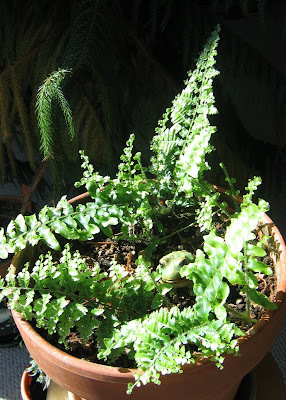 Now, ferns do love coffee, but my fern was DROWNING, poor thing! That looks like something my dad would give me.I had no idea ferns liked coffee. I will pass this on to my aunt, who loves plants and coffee. Wow, maybe I'll have to brew a pot for all of the ferns that the frost killed a few weeks back. Hmmmmmmmm.Do they prefer cream and sugar or just black? I didn't know about the coffee-loving fern! Too cute! Coffee, I think I have heard that but never used it. Love the rooster watering can. I had no idea that ferns liked coffee…maybe that explains why the one fern I had back in college died after like 2 days of being at my house. I wasn't aware ferns loved coffee. That's my kind of plant.